Surprisingly, 62% of all support requests go ignored. How often do you respond to a customer service email? If you’re new to customer service email response templates, we explain how they can benefit your support team. To help get you started, we’ve created 7 unique customer service email templates that you can implement in your business immediately! Did you know that 62% of all customer email requests are never answered at all? Or for those that are answered, 27% of them are answered incorrectly? Customer service has been around since the first transaction took place thousands of years ago. And even then, if the customer was not happy with a purchase, he or she would complain. In today’s Internet driven world, if a customer is not happy, then yes – they will complain. Instead, they will complain to their friends and family on Facebook and other social networks, which means they could be reaching anywhere between hundreds to thousands of connections. To keep them happy, you need to answer their requests and respond quickly. So, wouldn’t it be great if you could answer more customer support tickets, faster? That’s where we’re here to help you. We’re sharing 7 customer service templates that you can use to answer more requests and quickly. Plus, you can copy and paste our customer service email response samples easily, meaning you can start using them right now. 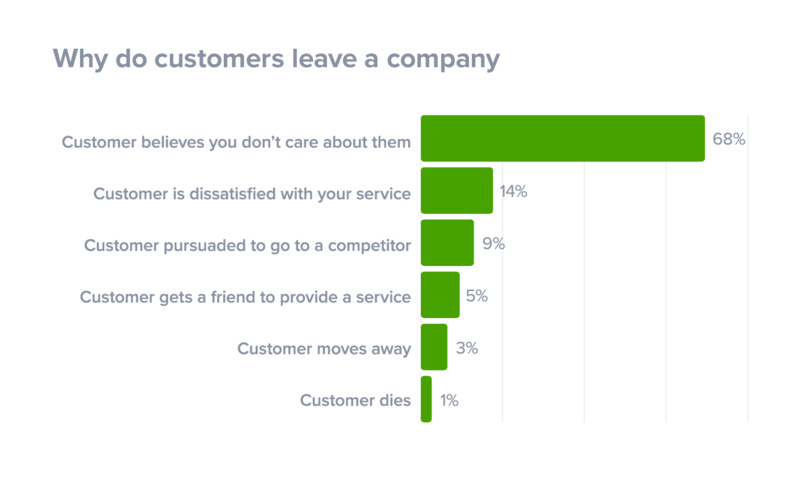 Did you know that the number one reason customers leave a company is because they think you don’t care about them? Brands like Amazon and Zappos have built billion dollar empires based on delivering superior customer service. And while 80% of brands feel are delivering great service, consumers tend to disagree. In fact, only 8% of consumers feel they have received superior customer service. Delivering great customer service is not easy and we need all the help we can get. Great customer service comes in the form of quickly acknowledging the customer’s email or request, addressing the customer by his or her name, focusing on solving the customer’s problem and generally making the customer feel like you care. And the best thing about customer service is that you have complete control of the service you deliver to your customers. Especially, when you use customer service email templates. Whether your business uses a knowledge base, an online FAQ or each response is handled freehand, you will find that common trends in questions or issues emerge quickly. Using customer service templates can help any business become more efficient. With SuperOffice Service, you can set up and store email templates. Whether it’s a thank you email for completing a form on your website to regular customer communication, each template can be personalized. But the benefits in creating customer support templates are not only limited to saving time. Other advantages include personalized messaging, reduced errors and being able to maintain brand tone and voice. Personalized messaging. Using macro’s within the support email templates, you can automatically personalize the message every time to include the customer’s name, address, product and pricing details. Reduce the margin for errors. As there is no need to retype each email, you remove a significant chunk of human error and risk of sending incorrect messages with potentially awkward consequences. Same brand tone of voice in every communication. As your team does not need to edit the text within the email reply, any person using the template can send the email and not have to worry about “getting the same message right”. Whether you’re looking for help desk email examples, business email templates or technical support email templates, our new white paper will rapidly improve the quality of support you deliver to your customers. Why customer service is important. Learn why customer service can make or break your business. A negative experience can be shared with more than 3,000 people where as a positive experience can creates customers for life. Seven customer service email templates for your business. Copy and paste any of these seven customer service emails and use them the next time you receive an email request to your customer support department. These templates will get you on the road to becoming customer service experts. How customer service affects customer loyalty. When you deliver exceptional customer service, your customers become loyal but you have one chance achieve it, as a customer will decide if they will become a loyal customer or not upon the first contact with your brand. So, be sure you make it count. Do you want the free guide? If a customer writes an email to you, it means they care enough to do something about it – Whether the email is reporting a bug on your website or requesting a new feature. It’s important to make sure every single customer email is answered. Responding to customers is a sure-fire way to make unhappy customers happy and it helps to create good customer relationships. Here’s 5 tips to responding to customer service emails. Customers value good service over speed. It might be the customer got lost on your website or cannot remember his password but read the email thoroughly before you write your response. If the email has too little information for you to solve the request, it’s OK to ask questions to get more information. Most emails sent to your customer support team are sent by human beings. It’s easy to forget this when you answer hundreds or thousands of emails per week, but people appreciate being treated like human – In fact, recent research by Cisco found that customers are willing to pay extra for a more personalized service. Make sure you address the customer by his/her name in each email you respond to. A customer who communicates a problem does not want to hear excuses of why the problem occurred. They only want to hear the solution. If the customer cannot login to his account because of a bug, there is no need to explain that it’s your web developer’s fault for forgetting to fix it – Find a solution and inform the customer the problem is fixed. It’s much easier for both you and your customer if you provide links to relevant sources on your website rather than explaining how to navigate through the site. Staying anonymous in your responses is the wrong approach. If you use a generic email signature, the customer won’t know who he or she is emailing with. Think of it like a conversation, it’s more natural to say your name instead of just company name and department. Using your own name will only strengthen the relationship. Great customer service inspires loyalty, creates brand advocates and increases revenues. Whether you are a small business or fortune 500 brand, this guide is the perfect step to help get you started on the road to customer service success. So, download the free guide, copy and paste the customer service response templates and start improving the quality of customer service you offer today! How do you use email templates for customer service in your business? P.S. Grab your free templates by clicking the image below. You're welcome, Krrish. Hope you find the templates helpful. how can I get the email templates? Great list of customer service templates! Good Afternoon. I'm looking for customer service email templates to send to the passengers traveling in our buseses who are giving negative as well as positive feedback regarding punctuality, cleanliness, staff behavior, and customer service. Do you have any email templates or advice? Hey! Awesome post, you can define the customer support email templates list in this post. this templates list is every important for all the business.so we can say that this post really nice and informative for all the businessman. Hi Chetan. Can you give me an example or two of the type of questions you receive so I can create the email templates? Thanks for the free download of the 7 templates that improve customer service. However, #1 and #6 have the same template letter. Should #6 be different? Thanks for your help! Hi Brittni, thanks for letting me know. 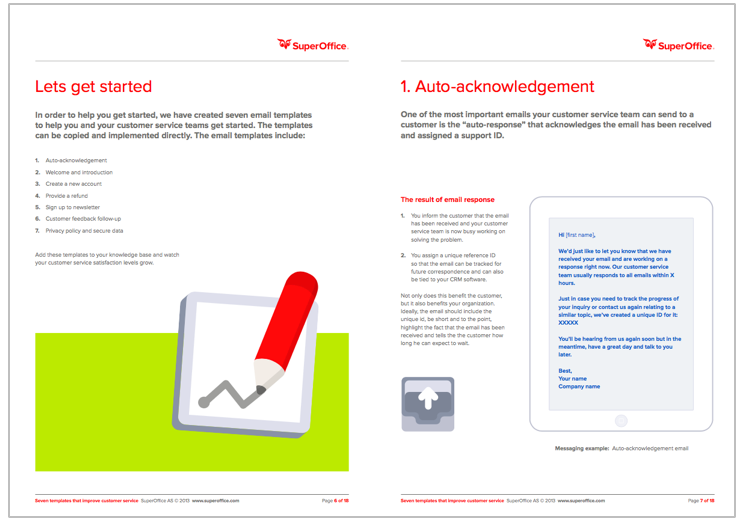 I've just sent you the 6th customer service template by email while we update the white paper. Thanks again! This is a great list of email templates. Thank you! Great list of email templates! Thank you! I like your list. It's a useful list of customer email templates. Thanks for great info sharing with me. Hi Steven! Unfortunately I can't download the templates and i don't know why. Can you help please?